Yes, I'm very much into slaw salads. Crunchy cool bowls of slaw make me happy at the end of a long day. This Curried Tahini Carrot Slaw has made it to my table more than a few times over the past few months since I first made it. And each time I make it I like to tweak it a tad. Sometimes I'll add in various nuts, avocado, different veggie accents or seeds. This time I added in a scoop of protein-rich hemp seeds. I loved the texture that they added. This fast and easy side salad is a perfect variation from a go-to green salad. And you can also check out the original recipe here (topped with tofu cubes). If you don't have hemp seeds - buy them! They have a great nutty flavor and sesame-seed like texture without the bitterness of sesame. Why is hemp so great?? - it is rich in Omega 3 and Omega 6 fatty acids - hemp contains all 10 essential amino acids. Nutrition: Hemp is rich in complete protein, vitamins, omegas. Hemp is gluten-free and nut-free. A few other slaw recipes I love..
Apple Tahini Slaw - speedy! 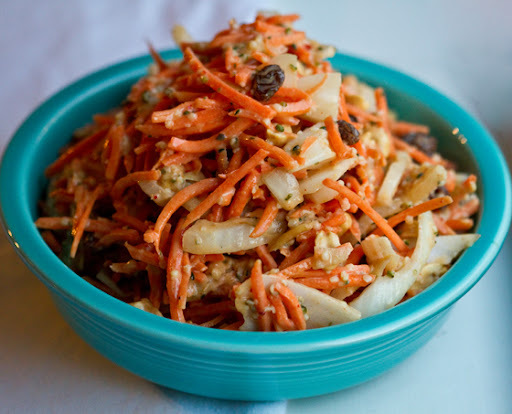 And find my recipe for my recipe for the (above pictured) Carrot Slaw on Babble's Family Kitchen.